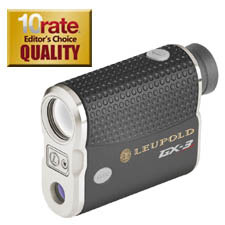 Another great option from Leupold the GX3i combines some great features with a small, tough, heavy compact design. It has the bright red LED lit display to separate it from the GX2i and also works very fast to display yardage. The included Pinhunter prism lock technology gives exact distance on those participating courses. It has a fog mode to cut through fog or rain and provide accurate measurement. Leupold’s lenses are the best on the market, more exact and better quality than the competition. When you want multiple readings in one quick sweep there is an optional scan mode on this rangefinder. Just hold down the Power button and the display will continuously update with accurate line-of-site measurements.